A consortium of OSJC Moscow Metrostroy and Hindustan Construction Company has been selected in the pre-qualification bid stage for the metro project that will connect Colaba to SEEPZ. OSJC Moscow Metrostroy, the company that is responsible for the construction of the Moscow Metro, has been shortlisted in the pre-qualification bid stage to build a 32.5 kilometre-line that will connect north and south Mumbai, the Mumbai Metropolitan Regional Development Authority (MMRDA) said. Metrostroy is jointly looking to construct this phase of the Mumbai Metro along with Hindustan Construction Company, which built Mumbai’s iconic Bandra Worli Sea Link and was also involved in some stages of the Delhi Metro. The Indo-Russian consortium will compete with several Chinese companies as well as the constructor of the Kiev Metro, Kyivmetrobud, which is making a bid with Afcons Infrastructure. The project is expected to cost $4 billion and will connect Mumbai’s main business districts such as Cuffe Parade, Nariman Point, Girgaum, Bandra-Kurla Complex and SEEPZ. When finished the metro line will take a lot of pressure off Mumbai’s roads, as well as its over-burdened suburban railway network. The metro, which is slated to open in 6 years, will also pass through the international airport and have interchanges with other metro lines, as well as the monorail and the Western and Central lines of the suburban network. Analysts believe that Metrostroy’s track record in the construction of the Moscow Metro and its teaming up with an Indian company that has successfully implemented several big ticket infrastructure projects across India will give it a good chance. It is believed that Chinese head of government Xi Jinping, who will be in India this week, will try and push the case for Chinese companies in this project. China is expected to offer India close to $100 billion in infrastructure investment, claiming that its firms offer more economic solution than Japanese and Russian companies. MMRDA is likely to choose the winning consortium in late November and work should commence in December. 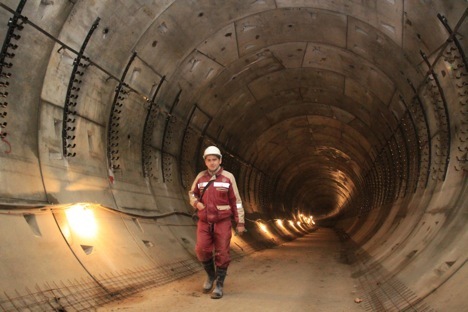 The completed line will have a total of 26 stations, all of them underground. Moscow Metrostroy has constructed 179 underground stations and over tunnelled 300 kms of lines in what is one of the largest metro networks in the world. It did not bid for the Delhi Metro, but is keen to secure a contract in the lucrative Indian infrastructure sector.